Like an artist of any medium, sitting in front of a blank slate (or screen) before you know your subject/inspiration for that piece is pretty much pointless. So here I sit in a little office room at the school trying to figure out what to write about for the day. The kids are having snack one room over. Gold Fish crackers. The colorful ones. Then I hear chatter from across the hall. "Braeden, can you find the green fish?" "He found it! Can you find the yellow fish?" "Braeden, can you find two fish? Yay! How about three fish?" "Braeden, can you say "f" for fish?" "Braeden, can you keep your hands on your lap?" Then I hear a chorus of the "Hands in your lap" song that Mrs. G made up for him. "Braeden, can you keep eating?" "Can I read Braeden a story?" Wow. Those students really care about him. They are amazed at what he knows, and they encourage him to show off his skills. Even though they are supposed to be eating quietly, I still love to hear them quiz him. And applaud him. And keep him in line. And marvel at him. Not only do I appreciate the attention they show, but I appreciate that it is the students, and not just the teachers (and Mom) who are engaging. But that concept would fill a different blog. Let me know if you'd like to hear it some day. Now is the time for me to express my gratitude for the students and teachers at the little "one room" schoolhouse at the northern most point in Michigan. To the students and teachers who take the time to get to know and encourage my son's strengths. Who understand and extend extra patience to the preschooler with the extra chromosome. Who, at the same time, uphold the same standards of behavior and expectations that the other students have. Braeden loves to go to school. He loves the teachers and the students. He loves to learn. He loves to get out of his own house for a bit and see other people besides Mom. (Okay, I'm assuming that last part). And it's all good for him. It's all good for everyone. 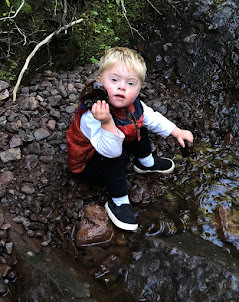 Living in a town with limited access to everything except gift shops, the splendors of nature and a wonderful community, one never knows how a child with "special needs" will fair in the education department. His speech pathologist in Calumet and his physical therapist in Houghton are each thrilled with his progress. He is nearly exceeding the goals they set at the beginning of the year, and he's only half way through! So thank you, little Copper Harbor one room schoolhouse. You are helping this little boy maximize his full potential. That is my biggest goal for him.